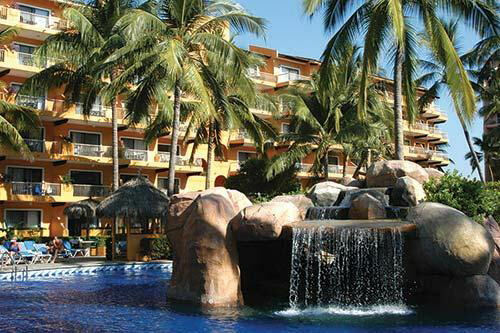 Buy a 7 Nights in a Studio, 1 or 2 Bedroom Suite in Villa Del Palmar in Puerto Vallarta, Mexico! Villa Del Palmar in Puerto Vallarta, Mexico- Buy a 7 Night Stay in a Studio, 1 or 2 Bedroom Suite! Enjoy 7 Nights in a Studio, 1 or 2 Bedroom Suite at Villa Del Palmar in Puerto Vallarta, Mexico! Looking for an all-suite property where everyone in your family can spread out? Or perhaps you want a romantic hideaway private enough for two? Villa del Palmar offers a gamut of options so you can watch the sun set on the horizon while you consider how to spend your next day in paradise. Our Villa Suites offer spacious living accommodations, kitchens and a private balcony or terrace. Studio Unit: Sleeps up to 2, and comes with limited kitchen. FOR A 7 NIGHT STAY IN A STUDIO UNIT! 1 Bedroom Suite: Sleeps up to 4, Comes with limited kitchen. FOR ONLY $150 FOR THE ENTIRE WEEK! 2 Bedroom Suite: Sleep up to 6, comes with limited kitchen. This resort charges a Service Fee of $3.50 USD will be charged per unit, per day.